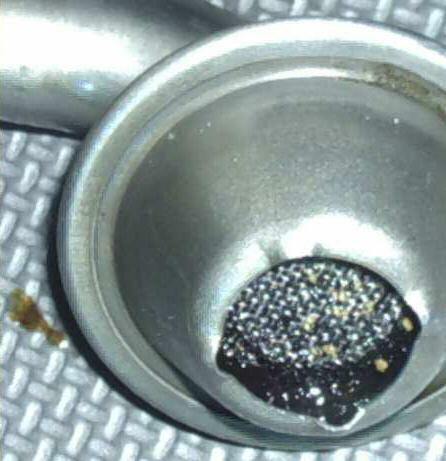 Although this A4 is still within the 4yr/50000 mile warranty, Audi is calling it an abused vehicle because the previous owner went 500 miles over their prescribed oil change limit and is therefore refusing to honor any warranty claims whatsoever regardless of any relation to sludge. This includes reneging on the included 40K service work. They weasel out of the warranty even though they erred by specifying 10,000+ mile oil changes with mineral oil, a small oil filter and low oil capacity in a hot turbo charged engine. It's been years since I wrote this. The vehicle is doing fine and the oil pressure is still good, so they are salvageable. I feel confident in saying that you must do a procedure similar to this to de-sludge a turbo charged engine with hard, tarry carbon deposits. 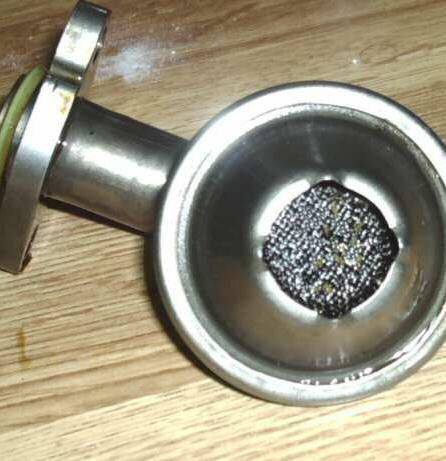 It may be different for other engines with sludge gelling, but solvents used in a running 1.8L turbo will either have no effect, or if strong enough will ruin the seals requiring even more work. Even if you managed to dislodge some of the carbon it would end up clogging the oil pump suction screen. It is replacing the oil pump pickup tube that makes this job so difficult for the do-it-yourselfer because that requires supporting the engine and lowering the subframe in order to remove the oil pan. If your pressure has truly lowered to blinking engine light levels it is well past saving with some sort of engine flush. It takes a lot of sludge covering the screen to lower the pressure that much. This shows the view since my engine was cleaned. The test for sludge is very simple. 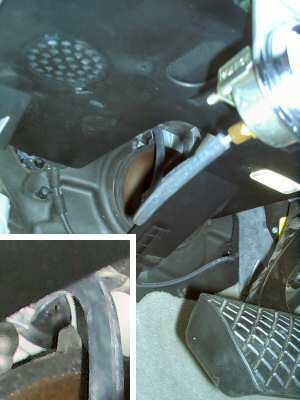 Remove your oil filler cap and look inside. It shouldn't be all black inside. Your main view is of the plastic oil diverters over the camshaft bearing caps. Those are black. Most everything else is silvery metal, though your view is very limited. It's all right if there is a semi-transparent varnish coating. If you can scrape off a thick, tar-like substance with your fingernail you have a problem. There's no need to post a before shot because it would be all black. If you doubt that take a look at my valve cover as it was. Another simple test is to put your drained oil through a paint filter and check for carbon particles. 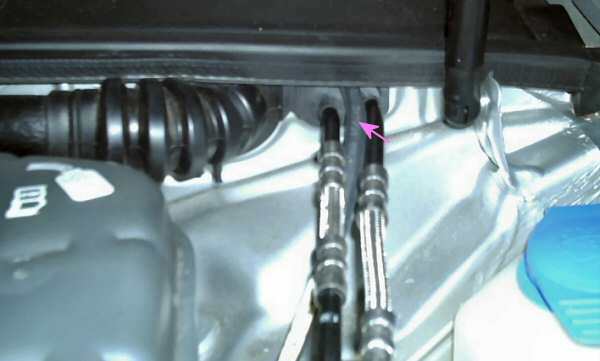 One obvious place to connect the oil gauge sender is at the location of the stock warning sender. I wanted to leave the warning light intact so I installed my gauge in place of the plug marked in red in this diagram from the Bentley manual that I modified. I can't be sure that this is the best site, but it showed me when my pressure was low and it shows my pressure within the proper range since the sludge repairs. It is also at least as accessible as any other spot. I moved the radiator overflow tank aside to get what was at best limited access. I went with a cheap mechanical gauge with nylon tubing, thinking that I could upgrade later if necessary. The mechanical gauges are said to be more accurate and to have quicker response than the electrical senders. I figured there was no reason to look for copper line based on the warnings I had heard about vibrations eventually cracking it. I already had 6' of 5/8" i.d. windshield washer hose around the house so I stuffed the nylon hose in that. It kinked a little when I tried to push too much at once. Pushing in no more than 3/4" at a time worked well. Once it was in the rubber hose it behaved well during the install. To gain access for the install I removed the plastic engine cover, the weather stripping that holds the long plastic cover over the rear of the engine bay, and I pushed the coolant reservoir out of the way. Only one screw has to be removed to move the reservoir, but the plastic prongs, which go into the metal tabs on the firewall, were hard to work free (pulled up on the reservoir and towards the front of the car). I used ratchet extensions and a swivel to get the plug out and put in the sender. Then I used a small crescent wrench to fasten the hose with its compression fitting. After dropping wrenches and having to fish them out of the belly pan it finally dawned on me that I could tie a string to the wrench. Copper oil gauge fitting installed in oil cooler housing. This is viewed from above from the driver's side looking through the intake manifold. There is nothing enjoyable about manipulating parts and tools down there. You should start this part of the installation first. If you give up there's no sense in having a gauge installed in the cockpit. You can see the brass pipe fitting that screws into the oil filter housing and the brass compression fitting nut that secures the white nylon hose (which is just barely visible before being blocked by the U-shaped hose in front). I wish I had known that the sender had a tapered pipe thread. It would have spared me from an unnecessary trip to the auto parts store thinking it had either defective or incompatible threads. It didn't take much tightening to make it leak proof and I don't think you'd want to over do it as the filter housing looks like it's made of aluminum. Oil gauge line routing through firewall. Oil gauge line routing near break pedal. There are two firewalls. 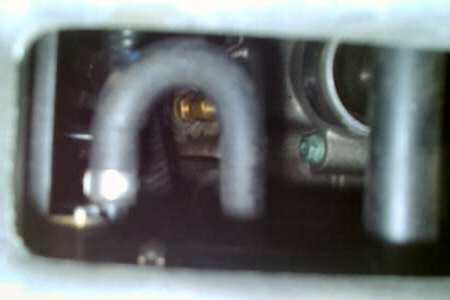 On the engine side I peeled back the weather stripping and ran the hose above an oblong grommet for two metal lines. The hose is marked in the image below. It then runs to the left from there between the two firewalls. On the inside I cut a hole through an unused round grommet shown close up in the inset of the photo. I mounted the gauge on the black plastic. I used the full 6' of hose. The gauge is partially blocked from view when I am driving so that I can't read the number at the top of the dial. I can still see the needle though. There is a chance of breaking the line when getting in and out of the car. That would cause a lot of oil to spill if the engine were running. (At over 20 psi I'm guessing it would be like a super soaker water gun). I plan to secure a larger piece of hose with electrical tape to cover the transition between the coupling nut and the rubber hose. Another location for the gauge Also, some like to remove the center vents and install there. 45 psi @ 2000 rpm, reaching close to 70 psi during hard acceleration. I'm thinking the 45 is close enough. Anything to worry about? — This car had its oil pump replaced at 25k miles and has had oil light warnings since. I'm thinking that now with the proper oil, filter and interval specs the sludge problem has been reduced to one where the sludge is gradually being cleaned up and is clogging the filter. The dealer has my next oil change interval at 2000 miles. 1300 miles since the oil change and now my pressure won't get above 30 psi (2 bar). Finally, the oil warning light came on when the pressure was about 20 psi and below while driving. Since this car has valve tappets, which require a minimum pressure (else they begin to make a loud racket), the warning pressure threshold is higher than other cars which may not warn until the pressure drops to about 6 psi. I never reached the point where the tappets clattered. I will finish this section when I have finished dealing with them. Until then you can always search the Audifans archives or Google alt.autos.audi. Well it's been years without adding to this section. Long story short: At first I was getting my oil changes and any other work as covered by the standard warranty and they said I had an oil problem. When they finally said the vehicle had sludge, they also said the vehicle had been neglected by the previous owner who had it for it's first two years (for going a bit over 12k miles on the second oil change instead of the prescribed 10k+—the vehicle had been in for repairs at 19k miles, but that was too soon to be done under the warranty). Therefore they said the warranty was no longer valid (even for anything as unrelated as a radio malfunction or whatever else would normally be covered). The Audi Sludge TSB is on pdf-archive.com: TSB-Audi-Oil-Sludge-Repair That is on one of those annoying download sites that open up multiple ad pages, but the file is there. You can try the direct link, tsb-audi-oil-sludge-repair.pdf (66kb) If it goes missing search for Technical Bulletin C17-04-03 (Group:17 Number:04-03). That is not included in my version of the Bentley Manual which only lists a single TB about the oil cooler hoses under group 17, Engine Lubrication. The word sludge does not appear until the second page. It's basically a list of items to inspect and replace, some warnings about not using solvents within the engine, and how to determine if the engine is salvageable. One of my intake camshaft double bearing caps. 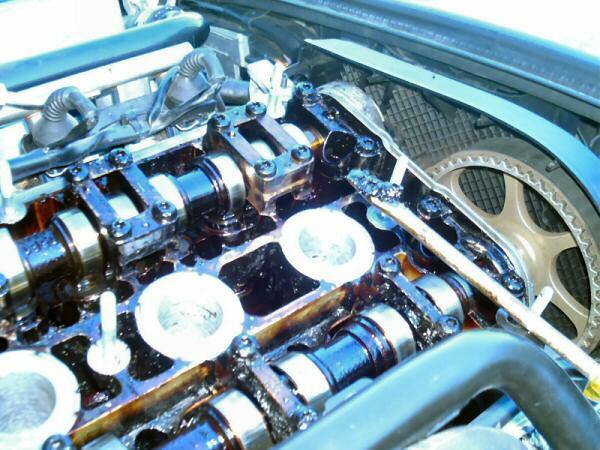 According to the TSB the state of the camshaft bearings is the test to determine if the engine should be salvaged. Apparently this is because these bearings are at the end of the pressurized oil flow path. So, it is assumed that if they are acceptable the rest of the engine is likely to be as well. It was easy to tell from the sludge around the bolts that my dealer removed only one bearing cap before telling me that my engine was salvageable. Having performed an oil filter analysis after following the TSB's cleanup procedure, I feel the TSB cuts a big corner when specifying that the head should be scraped in place. To do it right the head should probably be pulled and soaked in solvent as shown on this Toyota engine. There is bound to be sludge left in corners and other hard to reach areas after scraping the head. Hopefully with frequent oil changes, that shouldn't be a problem. The oil gauge will let me know if the pick up screen is becoming clogged again. Removed from the wells between the spark plugs. The Audi dealer wanted $3400 to perform the sludge TSB work or $300+ to replace the valve cover so that I could take it elsewhere. So I had it towed home and began the work myself. Well since the folks at Audi were kind enough to remove the cover for me I started with it. This stuff is hard to remove. I soaked this in various solvents, break parts cleaner, engine degreaser... I still needed to brush it and it still had some varnish on it when I finished. You could try soaking parts in carburetor cleaner overnight. 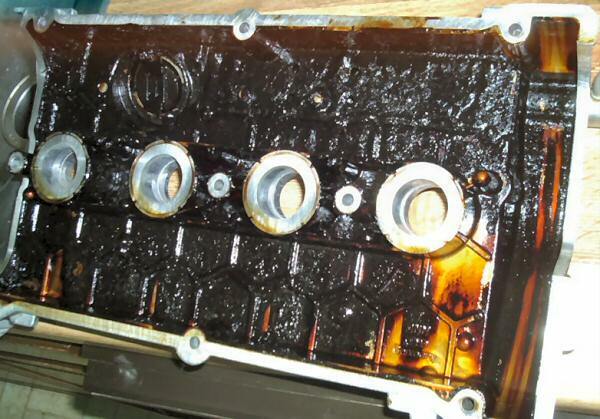 On the areas not immersed in oil such as the valve cover the sludge was hard and flaky or like undercoating. On dead spots filled with oil the sludge was soft like that on the screwdriver above. Audi does not recommend using engine flush chemicals and based on my efforts I'd say they would be useless on the hard stuff. I have also heard that they can cause oil seal leaks. This is part way into the cleaning. One of the double camshaft bearings has been removed and cleaned. The wall connecting the spark plug wells has been scraped, though some brownish varnish remains. The Audi sealants prescribed by the Bentley manual are exorbitantly expensive: about $70 for one at my dealer that I assumed must be for a vat of the stuff for the pros, but no, it was for something smaller than a toothpaste tube. It calls for sealant AMV-174-004-01 for the corners of the valve cover, AMV 188 001 02 for sealing the end bearing caps (probably anaerobic sealant typically called for in Haynes manuals and that auto parts store employees scratch their heads on), and silicone sealant D-176-404-A2 to make the oil pan gasket (there is no preformed gasket). I used Permatex Blue RTV sealant and sprang for the Ultra at $4.44 and I haven't had any oil leaks. I did have an oil leak after this repair where I couldn't find the source. This stopped when I replaced a bleeder valve that had become clogged which was probably pressurizing the crankcase (not sure if that would be the correct term/location) and blowing oil past a seal. Now comes the hard part! Getting to the oil pump suction screen. Try this at your own risk. I'm not taking responsibility for dropped engines or worse. I dusted off an old structural engineering book for architects and made some calculations that were enough to convince me. This does not attempt to explain all the details involved in removing the oil pan. It is only to show those special considerations for the amateur mechanic. I strongly recommend getting the Bentley Manual CD. It has the proper torque specs and tightening sequences as well instructions for lowering the subframe without messing up the alignment. To remove the pan the subframe must be lowered (actually tipped down in the front; the back is still secure). The subframe supports the engine. Once that is lowered the only thing supporting the engine is the transmission, so the engine has to be supported while removing the pan. Who has an engine hoist? I didn't and I wasn't about to buy one. I decided that I would be safe with 3, 2x10s and tie-down straps with a 1000 lb. working load rating and 3000 lb. breaking point. I mistakenly purchased 2x12s which turned out to be a good thing because the length of the strap below the ratchet is fixed and rather long for this application. This thing is heavy. I used some scrap pieces on the ends and center to connect the three beams. I could barely set it in position by myself. I have since decided that with the 2x12s I could remove one of the outer boards. The Bentley manual doesn't make clear the location of the rear engine eyelet for lifting. It is a black metal plate with the hole hidden by a plastic sleeve that supports a hose. Pull that off to attach the hoist. Note the 2x2s used on the inner edges of the fenders. I notched the beams slightly (too much and the beams would have touched engine parts) with a circular saw to fit over these. I may have placed cardboard under the 2x2s. 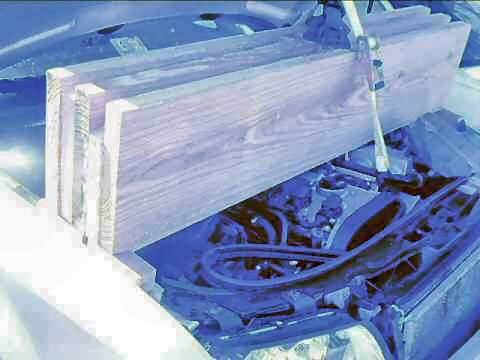 Homemade engine hoist, tie-down strap. Note the weather stripping peeled back and the coolant reservoir tank still connected, but placed aside. 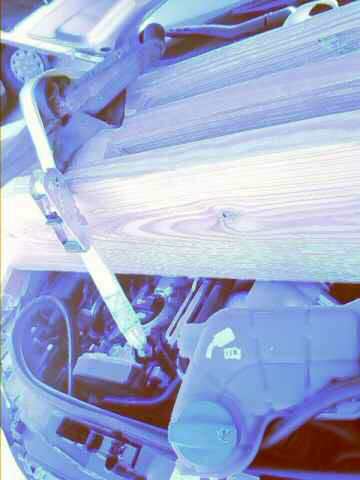 I used a scissors jack with a piece of radiator hose on top. I also added a second tie-down (not shown) for peace of mind. The manual says that the lock carrier must be placed in the service position. I didn't do this. (I didn't really know all that implied when I started the project. I eventually learned about that to do the timing belt and stored the front end of the Audi in my living room.) There might have been more room to remove the oil pan if I had. Beyond that the only reason I can see to do so is to easily reinstall the snub mount at the front of the engine. Perhaps this is different on a car with a manual transmission, but with my automatic snub mount I was able to push on the base to compress the rubber sufficiently so that the bolts could be reinserted. Place tension on the engine. Stop before it begins to lift. There's a special tool to remove the two pan bolts at the end of the transmission (#T10058). The flywheel has a notch in it to gain access to the bolts. 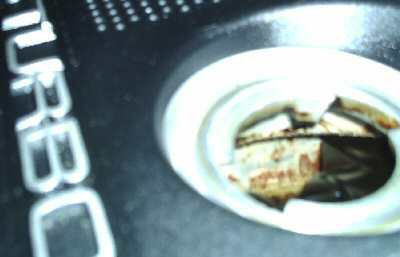 I managed to remove them with an Allen head socket placed lightly (not snapped in) on a swivel extension. It would be easy to round out the bolt this way. I noticed that most bolts break free and then turn rather easily. A bolt that feels like it's turning slowly under a lot of force is probably being stripped. Don't mar the mating surfaces of the pan when trying to remove it. You can tap it lightly with a rubber mallet. It won't seem like anything is happening and then it will break free. 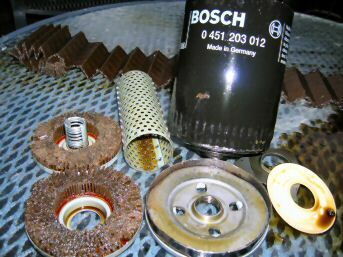 Sludge clogged oil pump suction screen. To remove the oil pump the sprocket must be removed. You'll need a large Torx (star bit). My basic drill set didn't have one large enough. I think the size needed is a T40. I probably needed only a new suction tube, but this job is so time consuming that it seemed pointless not to spend $100 for a new pump. I thought I was going to get a knock off, but the pump had Audi/VW and the proper part number on it. The problem was that it came with a much longer spout than the original shown below. I think it must have been intended for use in the transverse VW engine, a design that allows for a larger pan (and more oil, I've heard this may be why the VW with the same engine has fewer sludge problems). So I had to bite my lip and buy a spout from the dealer. The yellowish bits are fragments of the oil-stained, white RTV sealant used on the pan when the dealer replaced the pump at 24,000 miles. The majority of the blockage was due to the hard carbon bits as well as some softer sludge. Since it is black it's hard to see in the photo, but most of the screen's openings had some piece jammed in and the tapered edges were packed with sludge. All my attempts to clean this part by soaking in solvents and Drain-o and by spraying solvent with an extender placed right at the back of the screen were futile. The oil pan had hard sludge that got worse higher up on the walls of the pan. I got it spotless using a steel wire brush wheel on a rotary tool. I tried a softer brass brush initially, but it disintegrated too quickly. Crankcase ventilation parts for replacement. For my car the TSB says to replace the parts circled in the diagram. According to the dealer technician you should definitely replace the items in red. The one on the left is listed in the ETKA as a bleeder valve (#06B103245, good price here and here). The mechanic at the Audi dealer referred to it as the PCV valve. My Audi has a 3-way valve (some are straight so check your part no. ; might be 035103245A ...or G?). I posted my story about this part along with the error codes caused by it to AudiFans. The other part (circled at right) is the vacuum suction jet pump (or brake booster suction jet pump, #058133753B, best price I found). I finally got around to checking this part and found that it was perfectly clean inside. (It actually broke apart at the seam when I was trying to remove the hoses) There are alternate arrangements to that pictured above depending on VIN# (AMB up to ...8E*3*100001) where this part is connected with a hose directly to the PCV. That may be the case where clogging of this part would occur. If you try to clean the tubes and hoses be aware that the metal tubes are painted black inside, so use some care in selecting solvents or other cleaning agents. After the repairs the oil pressure looks good. I aim to keep it that way. Scraping the head as the Audi Sludge TSB states is not ideal. You can't get in every nook and cranny and scraping will dislodge the sludge, inevitably leaving some particles behind. These will move to the oil pan. The passages from the head down to the oil pan are large and unlikely to clog. The next item to clog is the suction pickup screen for the oil pump. 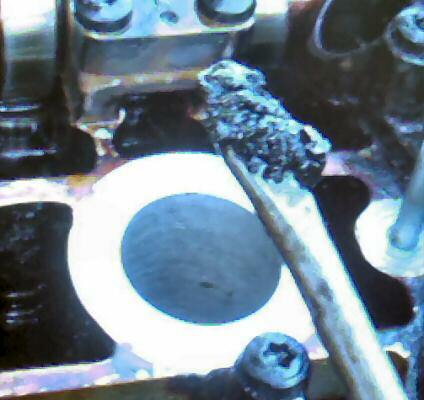 when that happens oil pressure is lost, which is the first critical problem caused by sludge. I couldn't bring myself to change $25 in M1 0W-40 oil every few hundred miles so I bought a pack of paint filters to strain my drained oil so that I could reuse it. 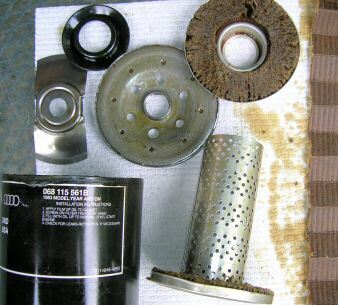 Parts of a Mahle oil filter. Here are the innards of the Mahle filter (#068115561) I just took off my A4 1.8T at 43,000 miles, 1400 miles since cleaning the sludge following the procedure in the Audi Sludge TSB. This was the first filter used since cleaning the engine. 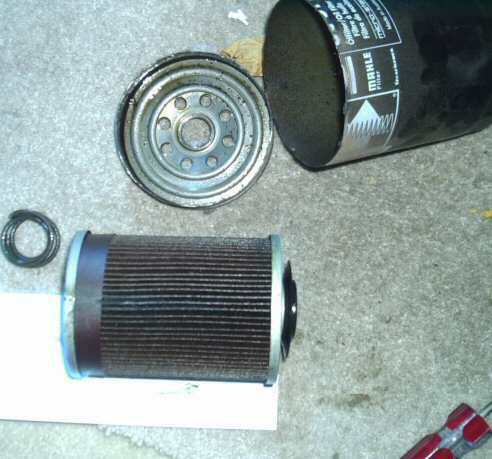 Though, if I remember correctly, I ran the engine after the repair and then replaced the old filter with this one. I cut it open using several of those cheap rotary tool cut-off wheels that disintegrate. I've since used a standard hacksaw with a metal blade and find it's just as fast (a few minutes) without going through all those cut-off wheels that bust up and can fly off toward your eyes. Either way it's messy. I use the hacksaw to cut out the paper filter as well. Not much to it. 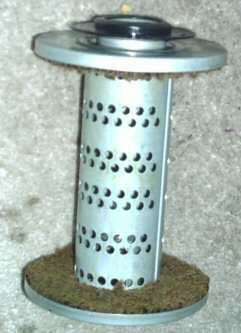 A spring holds the core and gasket against the open end. The gasket seals the incoming oil from the flow out the center and keeps oil from draining back into the pan when the engine is stopped so that it doesn't need to be filled before the engine gets any oil the next time you start it (not an issue on the A4 as the end of the filter is mounted upward). There is a spring-loaded gasket at the other end that will allow oil to bypass clogged paper if the pressure differential within the filter gets too high. I feel the TSB cuts corners, to do it right the head should probably be pulled and soaked in solvent instead of scraped by hand in place. Hopefully, next time this won't be so bad. It actually doesn't seem that bad now considering the amount of crud I removed from the head. People make a lot of fuss over filters. Obviously you want something of sufficient quality that the seals, gaskets and paper work as intended, but none of that should be hard for stuff as simple as that. The main difference I can see is that larger is better (though there is no reason to oversize given a specified change interval and engine). This filter probably has at least twice the surface area of the originally specified filter. 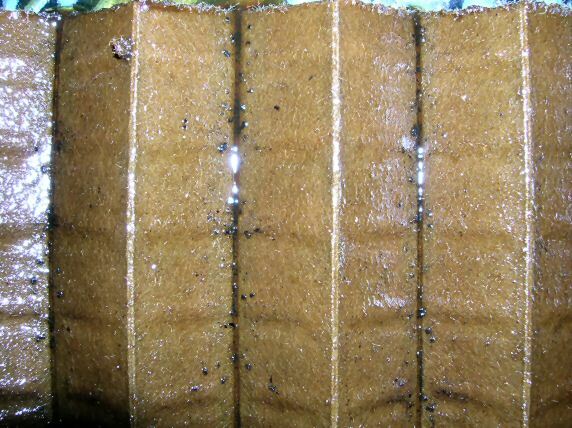 That means the same paper should be able to hold twice as many impurities before clogging. The only other factor is the type of paper. 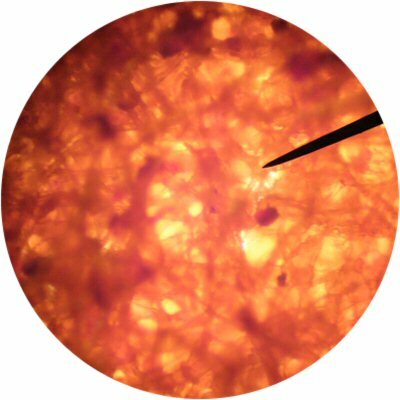 Some are paper (cellulose) and some are synthetic. Paper choice will determine the largest sized particles that are allowed to pass through to the bearings. There are some drawbacks to blocking small particles. The paper will clog sooner. If that happens before it is changed then oil will bypass the paper altogether allowing even the large particles to reach the bearings. 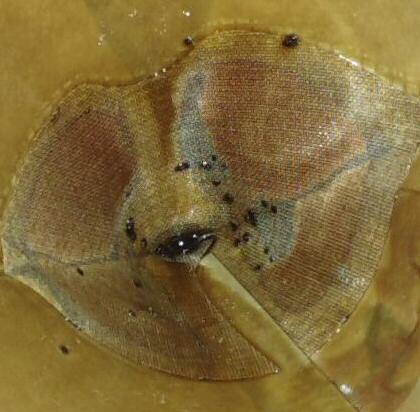 It would also be interesting to know if thick, cold oil bypasses the paper to some extent and whether this would occur even more so with a paper of a finer mesh. (part# 72174) After another 1000 miles it looks better: less carbon. After another 1700 miles even better (par# 068-115-561B). The Audi and the Mahle have similar paper. 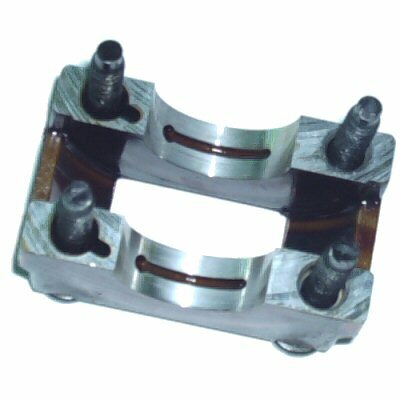 The Bosch and Audi use a leaf spring instead of a coil spring. The others use a metal strip to join the two ends of the paper together while the Audi is glued. Non-turbocharged: Tan colored, small amounts of hard carbon. 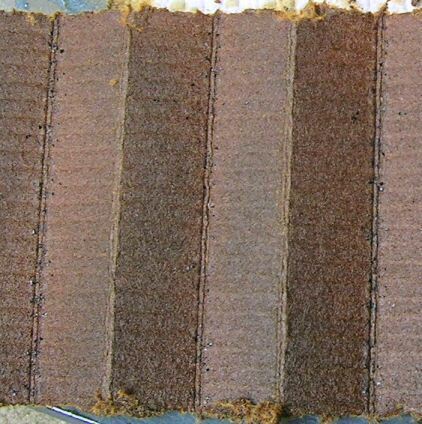 Filter paper should not be brittle. Dark filter media without significant hard carbon means the filter has not been changed often enough. 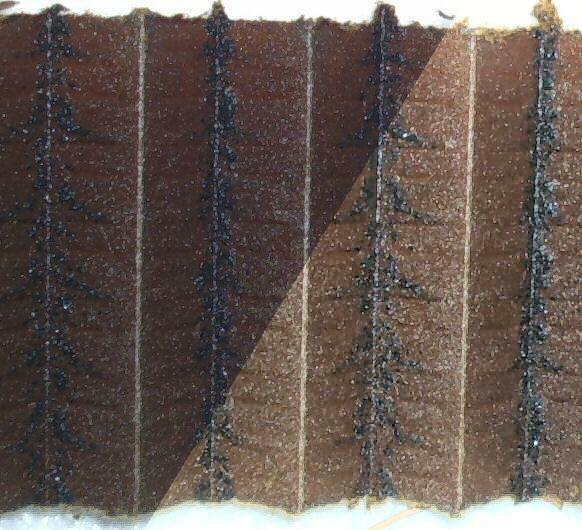 Dark filter media with significant amounts of hard carbon indicate high oil temperatures. Suspect compression blow-by, or poor engine baffle. Turbocharged: Tan to dark colored with more amounts of hard carbon. 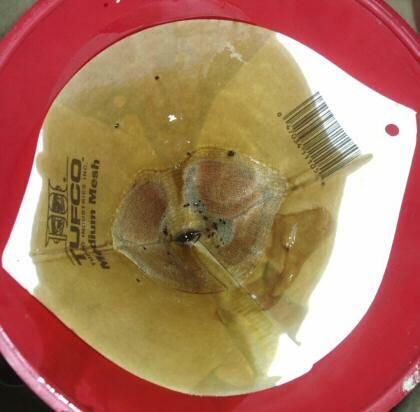 If filter media is brittle then filter should be changed more often or oil temperatures should be reduced. Just to be pointlessly nerdy here's a view through my microscope of the oil filter paper from one of these filters. A good hour long YouTube video from Edge Motors on cleaning up sludge in the 1.8L Turbo. While the problems with the A4 were glaring (any turbo charged engine should not be prescribed more than 10,000 miles on regular oil with a small filter further reducing oil capacity/buffering), any manufacturer may have their issues. This is a Toyota with gobs of sludge at only 8,700 miles! Hard to say what causes it in all cases. I wonder if different crankcase ventilation setups may play a role. Even identical cars may have different amounts of piston blow by which adds soot and unburnt fuel to the oil. Driving habits, such as lots of lots of short trips not getting the oil hot enough to burn off the water condensed from the air which then emulsifies the oil. What is sludge and why do i have it in my engine. alt.autos.audi 10k between oil changes!? Nine years later the car now has 110,000 miles on it and has gone 70k since the sludge cleanup. I've been doing 5,000 mile oil changes using Mobile 1 0W40. Still looks as good as when it was first cleaned as shown at the beginning of this article. No garage actually! Just a driveway and storage in the living room for the front end when you're doing the timing belt. OBD-II diagnostics through a Ross-Tech cable connected to the upstairs computer via a twenty five foot serial cable in the days before I had a laptop. While Ross-Tech is very good and allows complete access to OBD-II settings and measuring blocks, the days of a cheap install using an old version on a serial port are nearly over. You may want a Bluetooth OBD-II scanner instead. (I had a link there, but the price on it sky-rocketed from $24 to $100). You could probably ask friends or pick up an old laptop on Craigslist with XP and a serial port for under $50 and for far less hassle than dealing with a nerdy virtual box installation.